When we launched our Algorithm Framework in May, it was an exciting update for our community to leverage “drag & drop” modules of code that can alleviate inefficiencies in algorithm development. In a parallel effort to provide quants with more strategy examples, we are pleased to announce our integration with Quantpedia and to showcase our new Strategy Library. If you’re unfamiliar, Quantpedia is an online encyclopedia of quantitative trading strategies that make financial academic research more user-friendly to assist in idea generation. 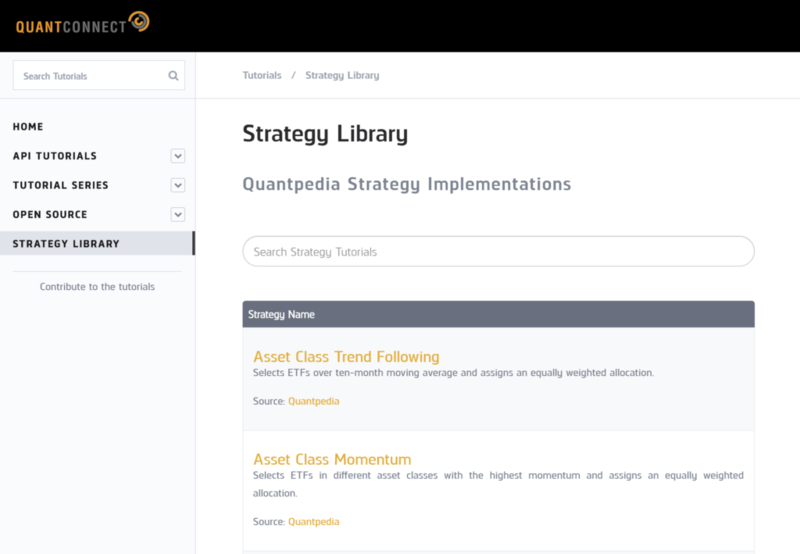 Quantpedia’s continually updated database of quantitative trading strategy ideas is derived from scholarly sources such as research portals, financial journals, and universities. The more than 350 strategies included in their database are carefully and specifically selected; only a small percentage pass their highly detailed selection criteria. On the user side, members can screen categorized strategies, examine related ones, or review visualized comparisons – all in an interface that is designed for convenience and accessibility. The combination of Quantpedia’s quantitative trading research and the implementation of the algorithms on QuantConnect will enable quants to explore new trading strategy ideas. Our new relationship will enable Quantpedia users to build algorithms and leverage QuantConnect’s multi-asset class backtesting environment to test new strategies against live data to refine their approach before they execute strategies into the market.